In preterm pattern quadriplegia, the legs are most involved and in full term pattern quadriplegia, the arms, hands, upper trunk and face more involved. The patterns are like bilateral hemiplegia and in some countries, they use this term instead of quadriplegia. Each of the children with spastic quadriplegia, dyskinetic quadriplegia and four-limb ataxia has different areas of their brain that has been damaged to produce their particular cerebral palsy pattern. 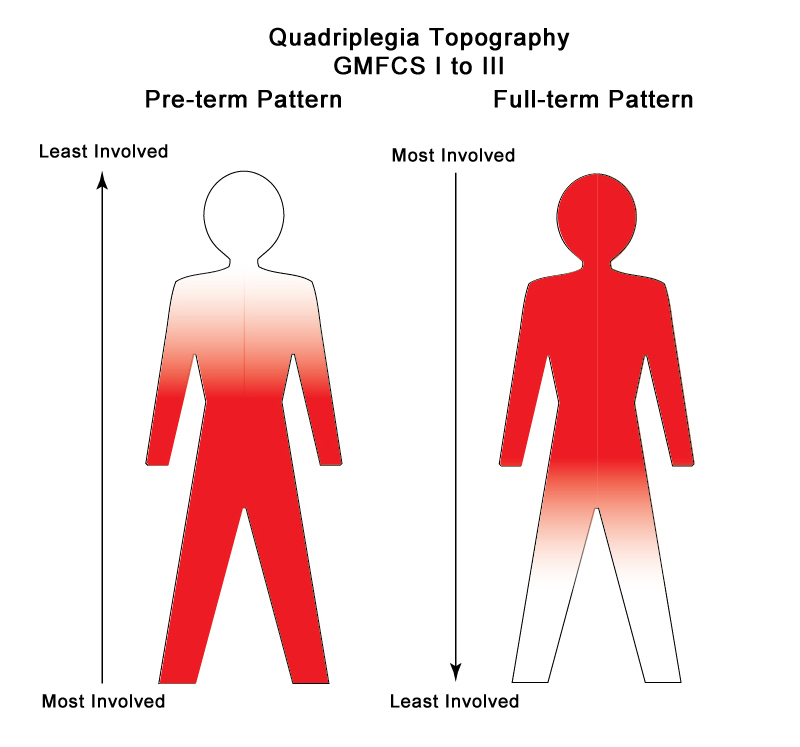 Currently, only 24% of children with spastic quadriplegia score at GMFCS Level I to III.1 I will discuss the spastic forms of quadriplegia first. What is the brain pathology and what does it mean? In spastic quadriplegia, both sides of the brain are damaged. The key difference between the 2 patterns is the site of damage. Most doctors tend to focus on what abnormalities can be seen in a brain scan and for a very long time I was guilty of this as well. Gradually I came to realize that if I was going to be able to set realistic goals and create the best possible treatment plan for a child with four-limb involvement, I needed a brain scan. In the best of all possible worlds, it would be an MRI at about six months post term age or later. My goal with this scan would be to assess the early resolution of the initial injury and to determine the amount of remaining normal brain. I believe that we all have to focus much more on what is left available for the child to use when there has been damage to the primary motor system. This pattern is caused by bilateral large Grade IV bleeds into the periventricular area and/or severe bilateral Periventricular Leukomalacia or PVL. In many babies, they co-exist. If you look at the diagram at this link, (Spastic Diplegia – Cure For Some, Improvement For All) preterm pattern quadriplegia has injuries in the same 2 areas, but they are larger. Damage is frequently asymmetric, with one side more affected than the other. The key point is the damage picks off the motor control of the legs more than the arms and hands. The trunk is always involved. As with all children with preterm pattern cerebral palsy, they may continue to improve in function, but at a slower rate than a child with diplegia alone. This pattern is found when the brain injury is asymmetric. Usually this means that there is more damage (a bigger bleed) involving the leg, trunk and arm on one side and just the leg and trunk involved on the other. There is less damage on one side, which means that one arm and hand are relatively spared. This is nearly always seen in the preterm pattern with both legs more involved than the one affected arm. Many of these children will evolve into a preterm hemiplegia pattern as the less damaged side slowly improves. Their pattern in the teenage years is often that of a teen with preterm hemiplegia. This is a more complicated problem. For infants admitted to a NICU, Hypoxic Ischemic Encephalopathy or HIE is by far the most common cause. (Hypoxic Ischemic Encephalopathy [HIE] or Neonatal Encephalopathy [NE]?) These babies, with diffuse cortical involvement are the ones that progress to full-term pattern spastic quadriplegia. In babies with HIE, there is a variable amount of damage to the cortical grey matter. This may be fairly circumscribed to the sensorimotor cortex on both sides or be more generalized. A very early brain scan may miss signs of injury as the process takes some time to evolve. The control of speech, upper trunk, arms and hands are most affected. Walking is hard initially as they do not have the same amount of control of their upper limbs to hold on. Most of the other causes of spastic quadriplegia like infection, metabolic diseases, brain malformations and infant brain trauma have a different history and generally present later in infancy. Babies with brainstem damage or cerebellar damage develop dyskinesia or ataxia. I will write about this group next week. What improvements are possible with repair, growth and maturation of the brain? All brains attempt to repair after injury. In these children, with more initial damage, the period of active repair will take longer and it can be very discouraging as you wait for signs of improvement. Parents need to remember that the infant has also had significant damage to the body as well as the brain. These babies are weaker than normal, in the same way an adult would be after a prolonged ICU stay. The overriding principle in the early days is to work with what works and the same is true for the older child now classified at GMFCS Level I to III. Alignment, which means keeping the body in as normal a position as possible, is the starting point. This group has a good potential for improvement over time, but it will take longer and it will require both more therapy and more interventions to get to their best possible level. In my experience, starting with good trunk support works best. Therapists have many ways to stimulate trunk control and strengthen the muscles, but these children with 4 limb involvement need more than the therapists hands for a few hours a week. How can we expect them to move against gravity if all 4 limbs are attached to a weak trunk? It is a good idea to check out the websites to see what is new and discuss the options with your therapist. Where do you start with treatment if everything is involved? Treating a child with quadriplegia almost requires a graduate degree in time management. A stable trunk is the first step and here is a simple test. Put the infant or child on his or her back and see what they can do out of gravity. Does arching diminish? Do the arms move more freely? Can the legs kick without posturing? Improvements in these areas are to be expected with good core support. Next discuss with your therapist the options to help the limbs. Preterm children will have more issues and need more help with the legs and the full term children need early help and support to keep the thumbs in a functional position and the wrists stabilized. Once you have alignment under control, there are many different therapies that help. However, they will help more if the child has a stable base and support when needed. Next week, I will go over the pathology of athetosis, choreoathetosis and ataxia with a few suggestions to improve motor control. Then I will write about the various co-morbidities that are so common in all the children with quadriplegia. As ever, I look forward to your comments and questions. Iona Novak, “Evidence-based diagnosis, health care, and rehabilitation for children with cerebral palsy”, Journal of Child Neurology, 29 (2014): 1141-1156. Thank you for the informative article. Can you comment on how you would characterize an HIE event that occurred after birth? My son’s injury happened when he was 12 weeks old when he nearly suffocated in a pack-n-play when he rolled over and got stuck in the edge. Would you characterize this as post term pattern quadriplegia? Dear Amy, I think an MRI scan will give some clue as to what to expect. If he suffered widespread cortical damage, then he will most probably evolve into a full term pattern quadriplegia. However, he may have suffered brain stem and thalamic damage that I will write about next week. This type of injury evolves in athetosis of a mixed dyskinesia…it is still a quadriplegia, but very different in the type of involvement. Hope this helps. Thanks for this great post! It’s been widely circulated on the HIE sites. I wonder does preterm pattern always result from PVL? My son was early, 32 weeks, but his MRI did not show PVL. Also, there are many children on the HIE sites who at age one receive a quad label that later is changed to either Diplegia or Hemi. Is this nueroplacticity or a misdiagnosis? Alicia, good questions! At 32 weeks, PVL is the most likely cause. If the scan was too early, it may be missed. Or…if the baby has later apneas or illness after the time of the scan, the damage may occur then. I think the most important part is to determine whether the child has a preterm pattern or a full term one. That is what you have to work with now and should help determine some therapy priorities. Changing diagnosis probably represents neuroplasticity…although no one is immune to diagnostic errors at times.I have seen this type of change more in children with the preterm pattern. Thank you for these blog posts! I have a couple questions. I have a 2.5 year old son who has spastic quadriplegia from a perinatal stroke. He is not ambulatory but walks with assistance (i.e. with an adult, he manages his gait trainer but doesn’t really utilize it for independence). I was wondering about habits – you talk a lot about waiting for the brain to recover, but how do you know when that is? We have amazing therapists but none have them have in-depth CP experience and I’m wondering how I know we’re building good habits (despite his wanting to “run” after his twin sister) and continuing to work on movements he may be making without great form (we’re in the process of getting DMOs). The other question I have is – how much does looking at an MRI help? Does it change any of the therapy we’d be doing? Thank you again. My son has a dx of spastic quadriparesis – can you touch on how this is manifestas and affects differently than quadriplegia and how that changes prognosis? Hello Lacey,the term quadriparesis is usually used with spinal cord injury, while quadriplegia is used with CP. Both mean 4 limb involvement. Hi whs t do you know about ocular motor ataxia & v.t? She is nine with a diagnosis of h.I.e & c.p. There is also one called Little Bear Sees. I would start with them. Hope this helps.